Valentine's cross patch puzzle. 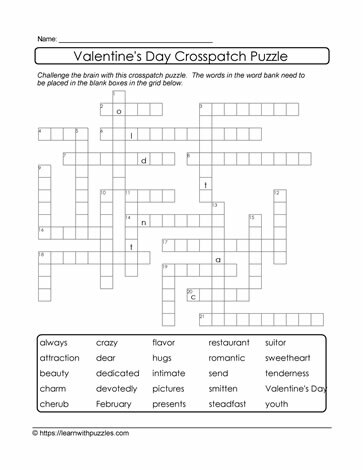 Here is a 25 word Valentine's crosspatch puzzle to engage students' brains and help with vocabulary building skills. Activate students' problem solving skills with these downloadable printable puzzles. Suitable for learners in elementary 3,4,5 grade classrooms and with differentiated instruction to support English language learners, these free puzzles complement theme based instruction. Puzzles also support learning in all classrooms: homeschooling, regular, digital and Google educational environments.